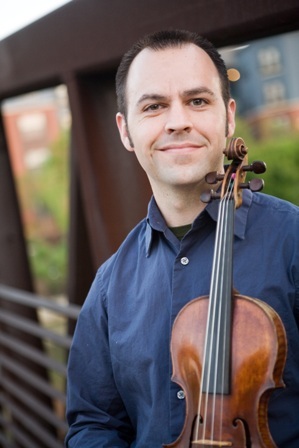 M. Brent Williams is Assistant Professor of Violin and Viola at Fort Lewis College (CO), faculty at the Music in the Mountains Conservatory (CO), and Concertmaster of the San Juan Symphony (CO/NM). Previously he served as Concertmaster of the Albany Symphony Orchestra (GA), Assistant Concertmaster of the Tallahassee Symphony Orchestra (FL), Assistant Concertmaster of Sinfonia Gulf Coast (FL), and Principal Second Violin of the Valdosta Symphony Orchestra (GA). He has performed concerti with the VSO, SGC, the Opera Teatro di Lucca Chamber Orchestra (Lucca, Italy), ASO, and the Valdosta State University (VSU) Percussion Ensemble. A dedicated chamber musician, Williams is the violinist of the Inverness Chamber Players and violinist/violist of enhakē <www.enhake.com>. With this latter group he won the Grand Prize at the Yellow Springs Chamber Music Competition (OH), First Prize at the 3rd International Chamber Music Ensemble Competition at Carnegie Hall (Boston/NY), and was a finalist at the Osaka International Chamber Music Competition and Festa (Osaka, Japan). enhakē has been praised for their “playing of the very highest caliber” (Fanfare) and “keen instinct for exciting programmes” (BBC Music Magazine). The group’s 2010 Carnegie Hall recital was lauded for its “rock solid rhythmic integrity...strengths in balance, intonation, and musicality” and described as a “polished, yet spontaneous performance” (The New York Concert Review). They have appeared in residency in South Korea, Costa Rica, Brazil, and at universities across the United States. enhakē’s latest CD, Prepárense: The Piazzolla Project, was called “positively delightful…[t]he sense of ensemble is near-miraculous” (Fanfare). Williams has also collaborated in chamber settings with artists as diverse as the award-winning Sima Trio and guitarist Oren Fader to zheng virtuoso Haiqiong Deng and Brazilian music expert Welson Tremura. Additionally, his arrangements/transcriptions of Argentine tangos and Brazilian choros have been performed in Japan, South Korea, Brazil, Argentina, Italy, France, Turkey, Switzerland, and across the United States. Furthermore they have been praised for being “uniformly excellent and imaginative” (Fanfare) as well as “[done] with considerable skill” (Infodad.com). These interests in particular led him to present a lecture-recital titled “Arranging for Would-Be Tangueros” at the CMS International Conference in Buenos Aires, Argentina (June 2013). Previously, Williams served as Lecturer of Violin and World Music at Valdosta State University (2008-2014) where he was the director/founder of VSU’s Pan-American Ensemble and member of the Azalea String Quartet. He has also been on the faculties of the Chapel Hill Chamber Music Workshop (NC), Blue Lake Fine Arts Camp (MI), and FSU Summer Music Camp. He received his DM and MM from Florida State University and his BMA from the University of Oklahoma. Williams has recorded for the MSR, Naxos, Koch, and Emeritus labels (classically) as well as for Barsuk, Pias America, Alchemist, Nub, and Engine Shed records (for non-classical projects).